Every year in February the FlexTech Alliance sponsors their industry conference focusing on flexible substrates and flexible electronics.Each year for the past four years the show has been held in Phoenix Arizona. But there were two things different about this year’s show. First, this year’s show site was moved from the desert of Phoenix, to the ocean side city of Monterey California. The second thing different about the 2015 edition was that We, Sun-Tec attended the Conference as the “newest FlexTech Alliance member”! We were officially became a member of the FlexTech Alliance in January of this year. And, Our Sun-Tec America General Manager Raymond C. Wiley was one of the three presenters on the Thursday agenda for Conference Session 24 covering the topic of “Adhesives for Manufacturing”. 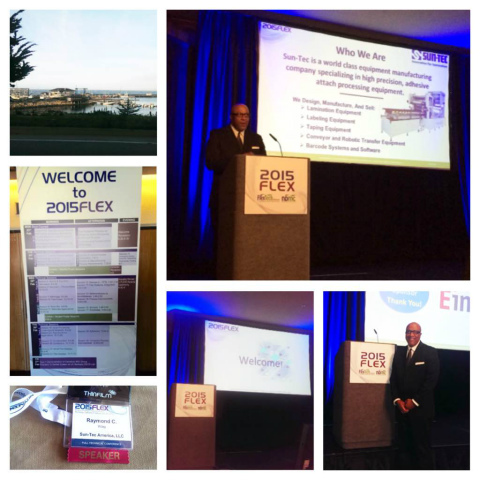 The focus of his presentation was “Future Challenges for Flexible Substrate Lamination Processing in Manufacturing”. In it he talked about Sun-Tec’s MPF equipment series and some of the many challenges we face with our customers when there is a new product moving into production. He also highlighted the need for early engagement and close collaboration with the customer when the project starts to avoid delays later. Thank you for the audience for the presentation. We are honor to become the member of FleTex Alliance. Thank you very much. If you are interested in our technology, please contact us anytime! About FlexTech Alliance FlexTech Alliance(From their website) : The leading US industry association focused on growth, profitability, and success throughout the manufacturing and distribution chain of flexible, printed electronics, and displays. FlexTech Alliance develops solutions for advancing these technologies from R&D to commercialization.